This weeks segment looks at new technology for detecting harmful algal blooms. Scientists may soon be able to detect harmful algal blooms from the sky. A team of researchers at the University of Iowa is developing a drone to detect harmful algal blooms in lakes and reservoirs. It will use remote sensing to collect aerial data with special infrared cameras. Currently, water samples are collected to monitor and detect harmful algae and toxins. The most common toxin-producing algae in Iowa is blue green algae, or cyanobacteria. It can cause rashes, gastrointestinal and respiratory problems for beachgoers. Last summer this toxin contaminated drinking water in Greenfield, Iowa. The drone will hopefully make detecting harmful algal blooms easier and allow monitors to catch them sooner. The project is being funded by a seed grant from the University of Iowa Center for Health Effects of Environmental Contamination, a research center which focuses especially on water quality issues in the state. This weeks segment looks at how increased temperature and precipitation will affect crop production in the Midwest. Increasing temperatures and precipitation will affect crop yields in the Midwest. The Midwest, often referred to as the breadbasket of America, is a major producer of corn, soybeans, and wheat. Rising temperatures and greater precipitation threaten farmer’s livelihoods. According to the Fourth National Climate Assessment, Midwestern states are expected to warm up more than any other region in the U.S. Currently, the Iowa average annual 5-day maximum temperature during a heat wave is in the range of ninty to ninty-five degrees Fahrenheit. 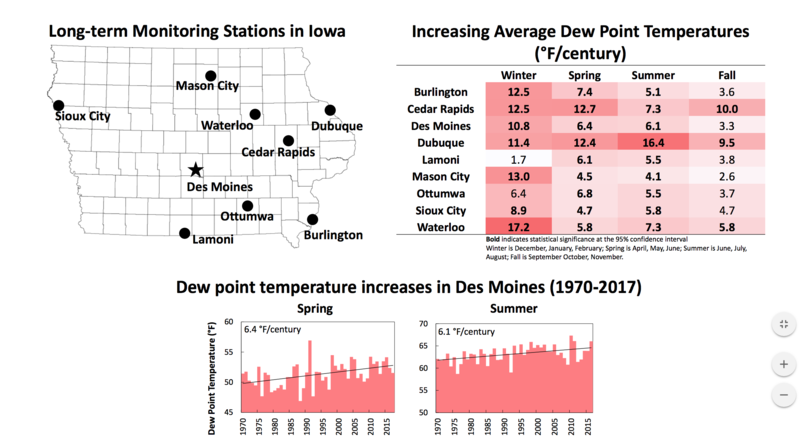 Now U.S. climate scientists are projecting that by mid-century, five-day heat wave temperatures in Iowa will increase by about seven degrees Fahrenheit for the average year and by thirteen degrees Fahrenheit once per decade compared to heat waves in the late twentieth century. Higher average temperatures increase the rate of evaporation from soil and plant leaves, leaving the land dry and arid and potentially damaging crop yields. Longer spells of high heat pave the way for droughts. The newly dryer land is then unable to properly soak up water from heavy rainfall, creating more flooding scenarios. This pie chart shows 2017 greenhouse emissions in Iowa by sector (from the 2017 Greenhouse Gas Inventory Report). Greenhouse gas emissions in Iowa rose 3 percent from 2016 to 2017, according to a new report from the state Department of Natural Resources. 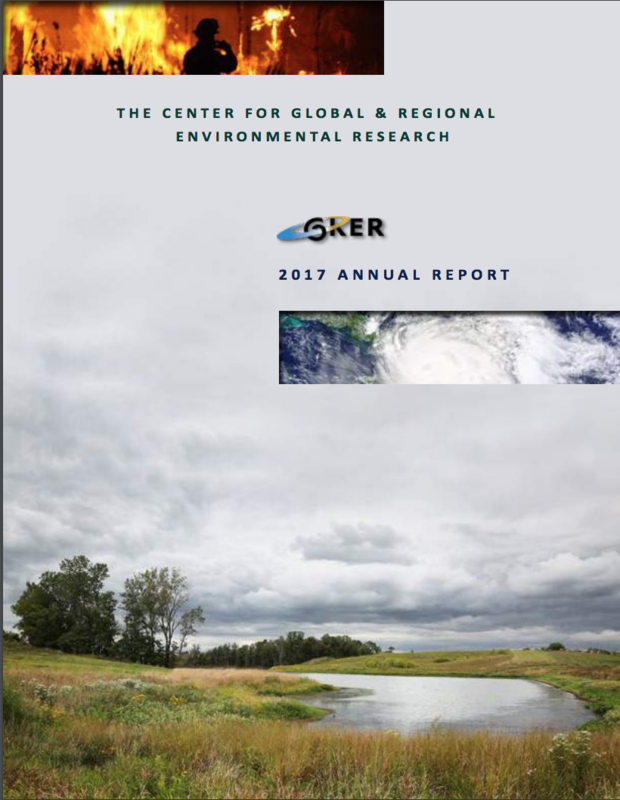 The report accounted for 131 million metric tons of emissions released throughout the state in various sectors including energy, agriculture and solid waste. The largest sources of increase were waste and industrial processes. Emissions from waste rose 28.62 percent due to increased decomposition of older waste in landfills. Emissions from industrial processes rose 31.73 percent percent, largely due to increased production of ammonia, up over 180 percent from 2016. The only sector to see decrease was natural gas production and distribution, which decreased about 10 percent and accounts for only 1 percent of total emissions. Agriculture contributes about 30 percent of the state’s greenhouse gas emissions, mainly methane and nitrous oxide, which are respectively about 25 and 298 times more potent greenhouse gases than carbon dioxide. These emissions largely come from animal waste and soil management. Despite this increase, total emissions are down 6 percent from 2008. The DNR projects that emissions will continue rising through at least 2020, and drop a bit more by 2030. Commercial trucks are a huge source of diesel emissions and a major target of the EPA DERA grant program (flickr). Regional, state, local and tribal agencies currently have the opportunity to clean up their air on the Environmental Protection Agency’s dollar. The EPA announced last week that it plans on awarding approximately $40 million in grants as part of the Diesel Emissions Reduction Act. These grants will fund projects that reduce diesel emissions from school buses, commercial vehicles, locomotives and non-road equipment and emissions exposure for local communities. The EPA is especially looking to benefit communities that currently have poor air quality and for projects that will engage locals even once the project has ended. This program began in 2008 and has awarded funds to the Iowa Department of Transportation in the past. The state matched the 2018 DERA allocation of $275,123 with funds from the Volkswagen settlement to put over $500,000 towards cleaning Iowa’s air. Interested agencies have until March 6 to apply. Those in EPA region 7, including Iowa, Missouri, Kansas and Nebraska can apply for projects up to $1.5 million.